August 14, 2010 - Frontier Airlines announced it has extended the lease agreement on its Denver-based commercial headquarters at 7001 Tower Road through May 31, 2020. Frontier has occupied the Tower Road facility since 2001. ?This lease extension further cements our commitment to our hometown, Denver, Colo.,? said Ian Arthur, vice president of marketing and branding. ?Denver continues to serve as Frontier?s largest operating hub with more than 150 daily departures to more than 70 destinations across our network. "We are thrilled to call Denver home and to provide our loyal Colorado customers with more destinations, better schedules and affordable fares to destinations across the United States, Mexico and Costa Rica.? Frontier?s customer service, in-flight administration and training, marketing, revenue management, and scheduling and planning teams will be some of the departments working out of the commercial headquarters. In addition, Frontier is moving its customer relations and reservations teams into the building this month. In total, the Company expects to have more than 500 people working out of the Denver headquarters. The 70,000 square feet Tower Road facility is owned by Runway Properties, LLC and Pawnee Transportation, Inc. and is conveniently located less than seven miles from Denver International Airport off of Pena Boulevard and Tower Road. Frontier Airlines was represented by Jamie Gard with Frederick Ross Company and Runway Properties was represented by Ryan Stout with Grubb & Ellis in this lease extension transaction. Frontier Airlines is a wholly owned subsidiary of Republic Airways Holdings, Inc., an airline holding company that owns Chautauqua Airlines, Lynx Aviation, Midwest Airlines, Republic Airlines and Shuttle America. Currently in its 17th year of operations, Frontier employs more than 5,500 aviation professionals and operates more than 550 daily flights from its hubs at Denver International Airport and Milwaukee?s General Mitchell International Airport. 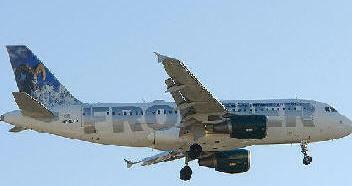 Frontier offers routes to more than 70 destinations in the United States, Mexico and Costa Rica. On April 13, 2010, Republic Airways announced that its two branded carriers, Frontier and Midwest, would combine under the Frontier Airlines name. The integration of these two airlines is expected to take 12-18 months.